Tracking and managing your files has never been this easy and affordable. With File-Coder you will know exactly where your files are located. Stop wasting time searching for lost files, get File-Coder and start tracking and managing your files today. Your ROI will be realized in a few short months. Watch a quick File-Coder overview video. Installing File-Coder is simple.Run the setup file and follow the prompts. During the install you can select from single user or multi-user setups. The main form is easy to read and always shows the current location of the file you are viewing. A History of where your file has been is available at the click of a button. 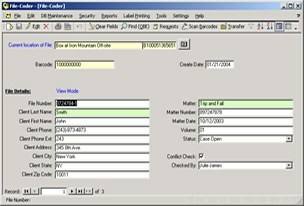 File-Coder allows you to print b/w bar codes directly on standard avery label stock. File-Coder easily integrates with many of the color coding print systems available. Here we are showing Colorflex's Intaglio print on-demand system.Read more about color coding software options including the newest Web based system. Easy to install, "Plug and Play"
Plug and Play - Simply place CD in drive and follow the installation prompts. Free phone support for first 30 days. Contact us if you have any questions on File-Coder or need any advice or direction on file tracking software systems in general. We will be glad to lend our expertise. File tracking software is a great asset to a company looking for reassurance that they can track their files easily and quickly at anytime. There are numerous advantages that come from utilizing a file tracking software system, some of which are dependant upon the each individual company and their particular circumstances and needs, but here are a few of the most popular reasons. Use of a file tracking software system allows you to track the location of any given file which greatly reduces the time it takes to do so and improves the speed and performance of your company or organization’s transactions. It is able to do this by placing a bar code on the file which is then scanned into the system and information can be pulled up regarding the files whereabouts, no matter if it is in storage or in your filing cabinet. This also reduces the chance of a file becoming lost and your employees having to scramble to find another way to get a hold of the data contained in the file. File tracking software is usually customizable to your particular needs and can be utilized by all employees in a company. The larger your company is and the more people that you have handling your files, the more a file tracking software system can benefit you. It is easy for one individual file to get lost in the hustle and bustle of productivity, but you can minimize that risk. Increase the performance and efficiency of your business by taking advantage of the rewards that a file tracking software system has to offer. Others claim to track you files, widgets, and the kitchen sink. Don't be mislead, they simply don't compare to File-Coder when it comes to the features, easy of use and capturing the information you need to manage your files. File-Coder uses bar code technology to track your files from person to person or from place to place. File-Coder shows you exactly where your files are and a complete history of where they have been. Copyright © FILETACTICS. 2001-2015 All Rights Reserved.